Tour de France favourite Alexander Vinokourov insists he has nothing to hide about his relationship with trainer Dr Michele Ferrari. Vinokourov has been training with the Italian, who has been linked with drugs allegations but had a suspended prison sentence reversed. "Ferrari has never offered me any medicine. He is only in charge of my physical preparation," the Kazakh said. "I know the way he works and I know I have nothing to be ashamed of." Vinokourov is considered one of the leading lights for this year's race, which starts with the opening time trial in London on Saturday. His best finish in Le Tour was third overall in 2003 but several leading names from the last few years, including last year's winner Floyd Landis, are absent because of drug allegations. 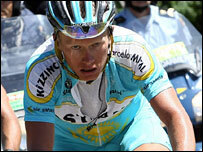 Vinokourov, who also came fifth in 2005, was one of last year's favourites but Astana had to withdraw after several of the team were implicated in the Operation Puerto doping scandal. "Vino", who two months later won the Tour of Spain, was not involved himself but was left without enough team-mates to compete. Ferrari has worked in the past with seven-times Tour winner Lance Armstrong - who defended the relationship in similar fashion - and Vinokourov's manager Tony Rominger.